It's been more than 2 years since a devastating kitchen fire at K Sandwiches resulted in a total top-to-bottom demolition and rebuild of the popular San Diego Vietnamese market and deli, but the company took to Facebook today to announce that they will triumphantly reopen, refreshed and ready for a swarm of hungry patrons this coming January 2018. A reported oven fire broke out at K Sandwiches shortly before 9pm on the evening of Tuesday, August 4, 2015 - causing a reported $1.5 million in damages. Although everyone was able to escape the blaze safely, the building was a complete loss and many questioned whether the deli would ever return. Owned by sisters Man, Natalie and Jennifer Tran, K Sandwiches opened at 7604 Linda Vista Road in 2006 and quickly became popular for its inexpensive and delicious Vietnamese Bahn mi sandwiches and fresh baked French breads and croissants. The fast-casual eatery will be very similar to the previous incarnation, even hoping to hire back all 15 of its former employees, and continue serving a menu of Bahn mi sandwiches, incredible croissants, fresh baked bread, smoothies, and more. 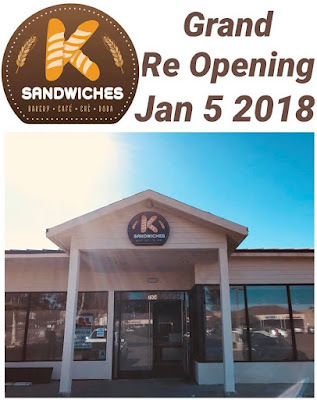 K Sandwiches rebuild is near completion, including upgrades like a modern design with expanded seating, a refreshed outdoor patio, and an enlarged kitchen and bakery. In addition to pastries and sandwiches, the fast-casual eatery also intends to expand its menu to add other traditional Vietnamese dishes and beverages like Vietnamese coffee and boba teas. K Sandwiches aims to reopen on January 5, 2018. For more information, visit ksandwiches.com.